Our taste buds love nothing more than fresh berries straight from the berry patch. Luckily, Arkansans can pick strawberries, blueberries, blackberries and raspberries at several sweet farms. Our taste buds love nothing more than fresh berries straight from the berry patch. Luckily, Arkansans can pick strawberries, blueberries, blackberries and raspberries at several sweet farms. 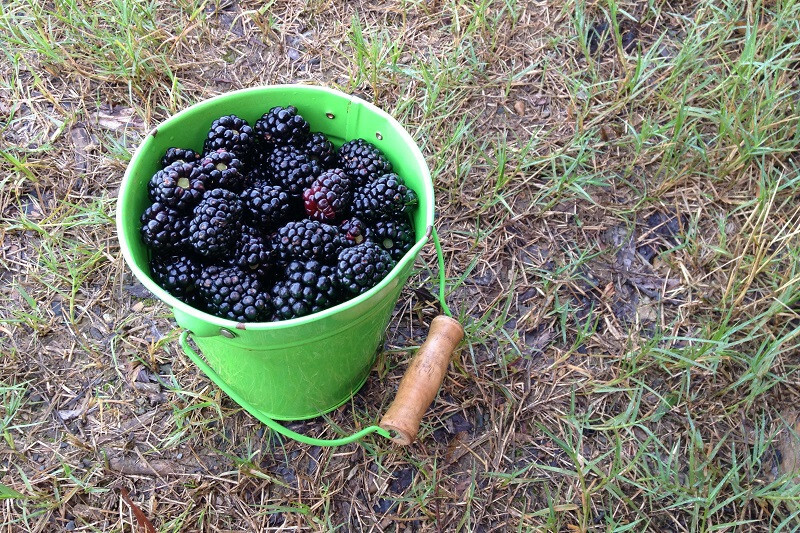 And, kids can easily participate in the harvest, tossing fistfuls of blueberries and blackberries in the bucket. The hardest part: Saving some for later! Blueberries will start ripening in mid- to late-May. 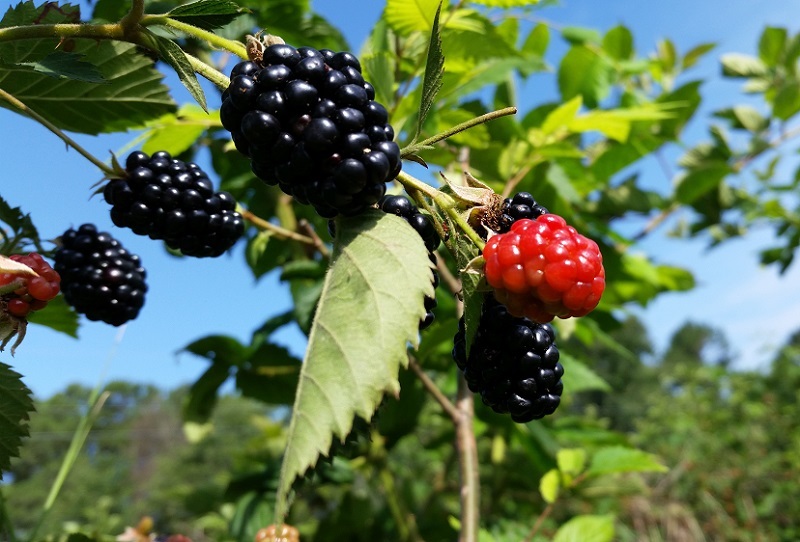 Later in the season, you'll even find blackberries at some of these pick-your-own farms. Keep in mind that the following opening days and growing schedules are estimates and may vary depending on the weather. Keep up with each farm’s opening and closing updates on their websites and/or Facebook pages throughout the season. Remember, it is always a good idea to call before you visit, as berry-picking may be suspended due to rain, extreme heat or limited supplies. This multi-tasking farm is a pumpkin patch in the fall, a wedding and event venue, and even a winery. 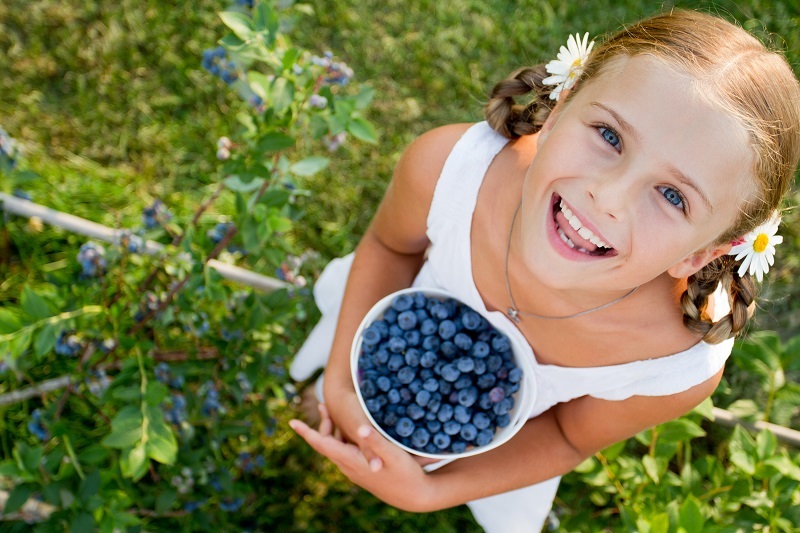 In the spring, families can pick blueberries and blackberries straight off the bush. You’ll find early varieties of blueberries ripening in late May; the blackberries come around the first of June. Schedule your visit at the right time and you may be able to leave with quarts of both—for about two weeks the blueberries and blackberries will both be available for picking. On Saturdays, visitors can visit the winery to buy blueberry, blackberry and muscadine wine made from the fruit grown on the farm. Local honey, jams, and assorted fresh veggies are also for sale. 13810 Combee Lane, Roland. Open late May through the first of July. Picking hours are 7 a.m.-noon Tuesday, Thursday and Saturday. Blueberries and blackberries $2.50 per pint. For info: (501) 519-5666; website. Cabot’s two you-pick strawberry patches are owned by a father and son duo—pick perfect strawberries at either location, The Cabot Patch or Mountain High Produce. Strawberry season typically ends in early June and peach season follows shortly after. Though the farms don’t allow customers to pick their own peaches, you can snag some of the juicy fruit, watermelons and more at their roadside stands. The produce stands are open through the first week of September: 7 a.m.-6 p.m. for strawberry season and 8 a.m.-6 p.m. for peach season. 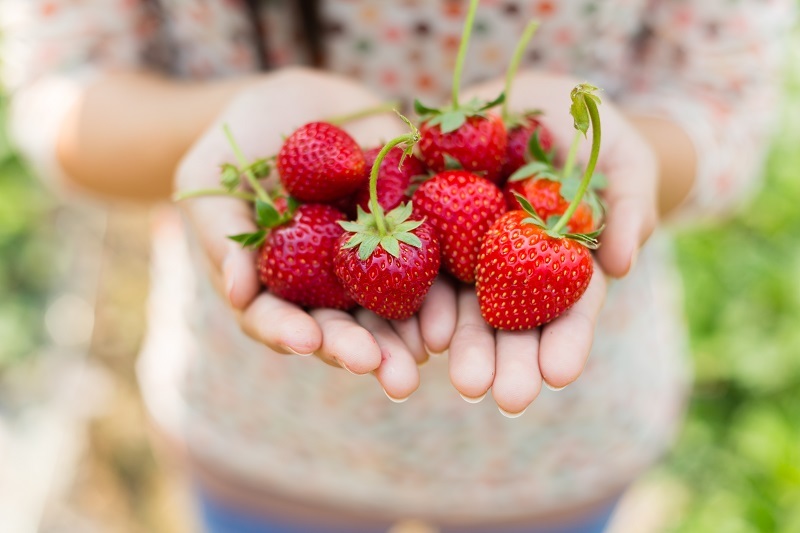 During strawberry season, you can also find the fresh-picked berries at other roadside stands around central Arkansas (visit website for details). Two locations: The Cabot Patch, 500 Mt. Carmel Road, Cabot; Mountain High Produce, 8881 East Justice Road, Cabot. Picking hours are 7 a.m.-noon daily. You-pick strawberries $2.50 per pound; other produce varies. For info: (501) 605-1313 or (501) 988-4720; website. This family-owned farm on Redlick Mountain has been in business for more than 40 years, and offers multiple pick-your-own experiences throughout the year. Pick strawberries in April and May, blueberries and blackberries in June, peaches in June and July, apples in September and October, and pumpkins in October! 1081 Hwy 818, Clarksville. Opens in April for strawberry-picking; hours are 7:30 a.m.-6 p.m. Monday-Saturday; call ahead because sometimes the farm closes early. Strawberries are $1.50 per pound, blueberry, blackberry and peach prices are TBA. For info: (479) 754-3707; website. This fruit and vegetable farm has pick-your-own strawberries in late April and May. Pick-your-own blueberries and blackberries are available in June and July. Raspberries may also be available in May. You-pick availability varies with the crop and the weather. At Fenton's Farm Market, customers can also purchase fresh-picked berries in season, although pre-order may be required. Vegetables grown at Fenton's Berry Farm and other local farms are also for sale. Fenton's Berry Farm: 7217 Fork Creek Road, Harrison. Call for hours. For info: (870) 741-9607. Fenton's Farm Market: 6715 Hwy. 7 South, Harrison. For info: (870) 741-6871; website. This you-pick farm located in the hills of the Arkansas River Valley offers blueberries and thornless blackberries. The berries are grown using organic practices, avoiding use of most pesticides or chemical fertilizers. If kids get restless, they can play in a sandbox or hang out on picnic benches. Picking begins around the last weekend in May. 1265 Will Baker Road, London. The farm is estimating an open date of May 21 this year through July 1. Picking hours are 7 a.m.-7 p.m. Monday-Wednesday and Friday and 7 a.m.-2 p.m. Saturday. Blueberries are $13 per gallon and blackberries are $12 per gallon. Call the farm and listen to their message about how much fruit is in the field before you leave. For info: (479) 293-3229; website. 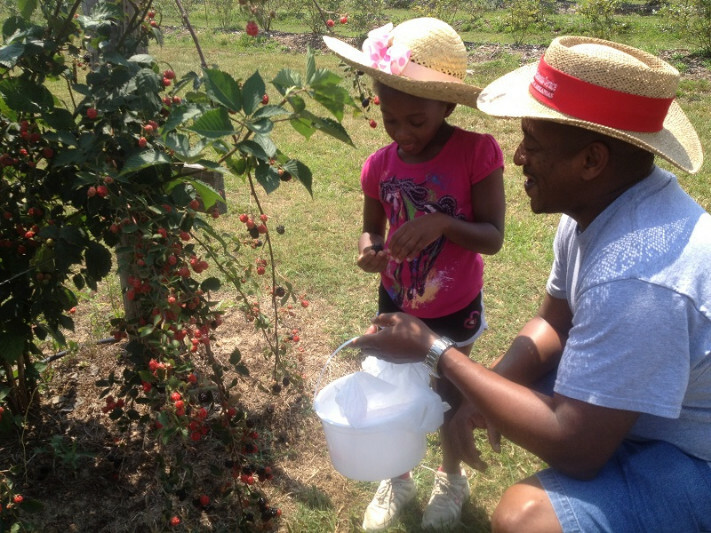 Marlee Rainey picks blackberries with her daddy, Ron, at Wye Mountain Flowers and Berries. On the scenic drive to Wye Mountain, you'll find this family farm that provides pick-your-own blueberries, blackberries and raspberries. Blueberries and raspberries will ripen around mid-May, Memorial Day weekend at the latest. Just a few weeks later there will be plenty of Arkansas-bred varieties of thornless Blackberries. You can also pick up freshly cut Zinnias and sunflowers! Plus, field trip groups are welcome by reservation Tuesday-Thurday; children learn about the flowers, decorate baskets for picking berries, learn how the berries are raised and how to choose the ripe ones, and then pick some to take home. 20309 Hwy. 113, Roland. Open for picking May 26 through mid-July. Picking hours are 7 a.m.-noon Monday-Saturday. Field trip groups are welcome by reservation Tuesday-Thursday ($6 per child; minimum of 10 children). Blueberries and blackberries $20 per gallon, raspberries $8 per quart. For info: (501) 330-1906, WyeMountain.net. Just about 20 minutes from the city is Faulkner Lake Orchard in North Little Rock. The family farm/event venue opens its gates to the public each year from mid-April through August. During this time, guests are invited to pick their fill from the pick-your-own peach orchard (the only one in Pulaski County), and load up on ripe strawberries as well. Call ahead to see what's available for picking. Along with the orchard, there is a children's play area, general store and event center. 503 Morris Road, North Little Rock. Open 8 a.m.-5 p.m. Monday through Saturday. Check on social media for updates on hours and berry availability: Facebook, Twitter. For info: (501) 961-9988, website. The farms supply buckets or containers to hold your pickings, and many sell or provide water for hot days. But here are a few things to keep in mind before you head to the berry patch. • Wear sunscreen and/or hats—it gets hot in the field! • Use an insect repellent—ticks and other bugs are common on the farm—and be aware of stinging insects. • Drink plenty of water and bring extra bottles for the whole family. • Take frequent rests in the shade if you or your child feels hot.